When Cora first started eating actual food, she LOVED vegetables. She could eat an entire bowl of black olives, broccoli, or tomatoes. As she got older though & realized what other foods/flavors there were she stopped eating all the veggies. It seemed these days, I had to “trick” her to get more vegetables in her diet. So I started racking my brain to see what the best way to do this was. I noticed on one of her store-bought food pouches which she really liked, was a full serving of vegetables. Since she loved these smoothie pouches with veggies sneaked in, I figured this would be the perfect way to make sure she was getting a well-rounded diet. But do you know how much those pouches can cost over&over, every time you go to the store?!?! TOO MUCH! Let alone the fact that making it myself would be healthier with no added junk to make it have a shelf-life. I’m no chef, I’m not even a good cook lol, I can barely cook anything honestly but, a smoothie would be easy enough for me I figured. 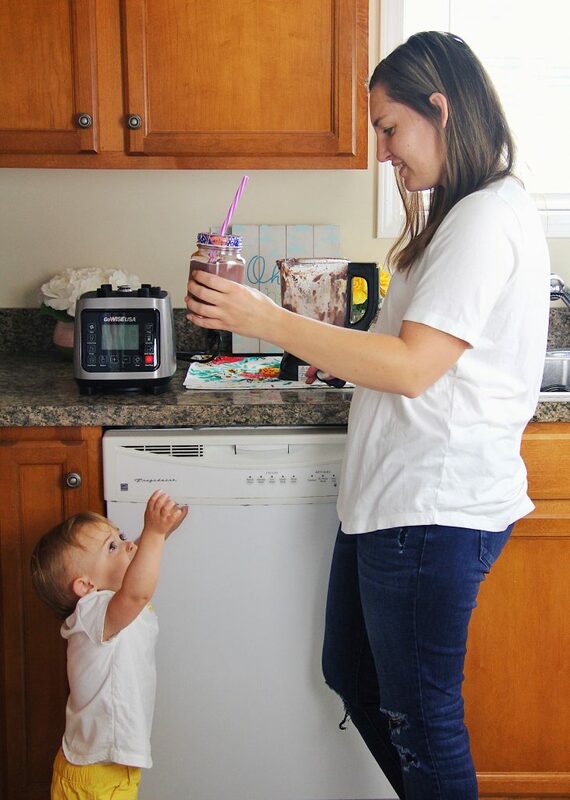 Especially if I had a great blender that would do everything for me, which is where my GOWISE BLENDER comes in! 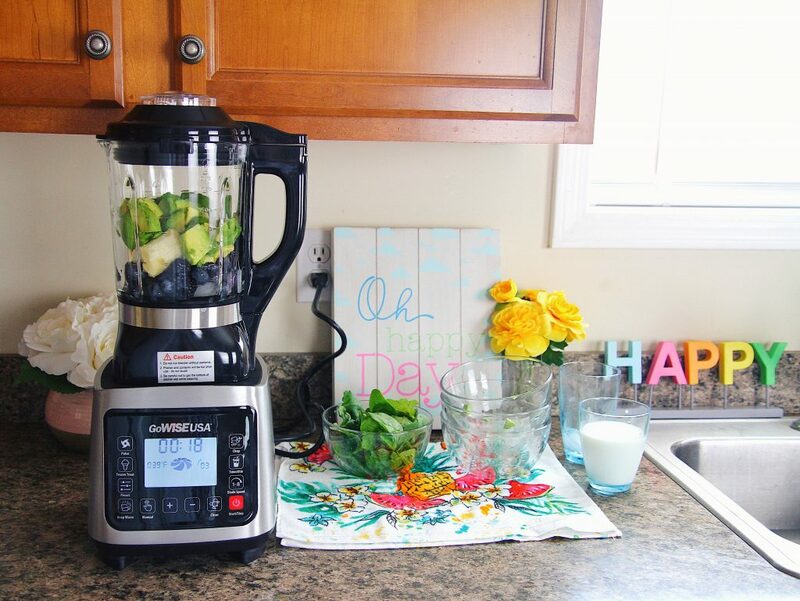 My new blender is a High Performance Heating Blender that can make soups, sauces, dips, smoothies and more. 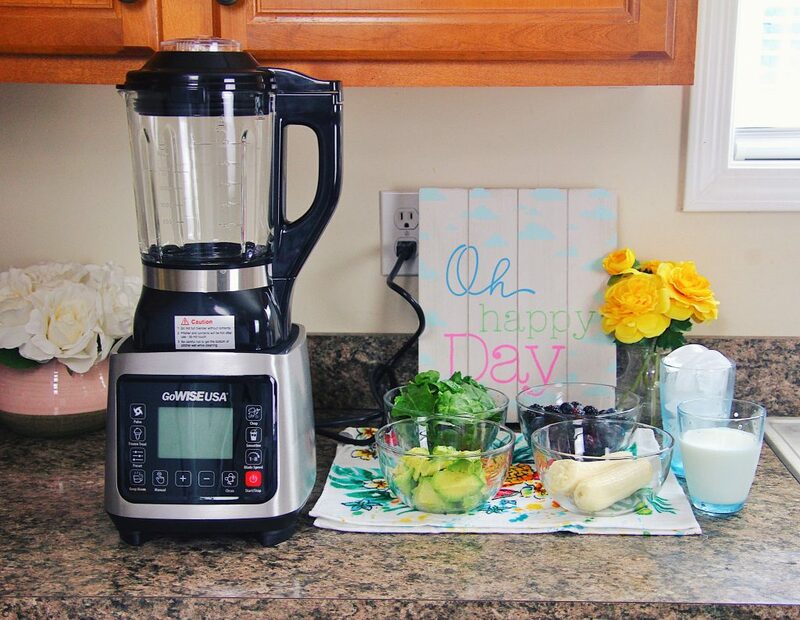 In my opinion, having an awesome do-it-all blender, whether you’re a pro in the kitchen or not, is very useful! So I decided my first recipe with my blender would be a Toddler Berry Smoothie. Instead of just searching a recipe online, I figured I’d go to the grocery store, pick what I wanted to have in the smoothie for Cora and create it myself. It actually turned out pretty darn good, and Cora LOVES them! 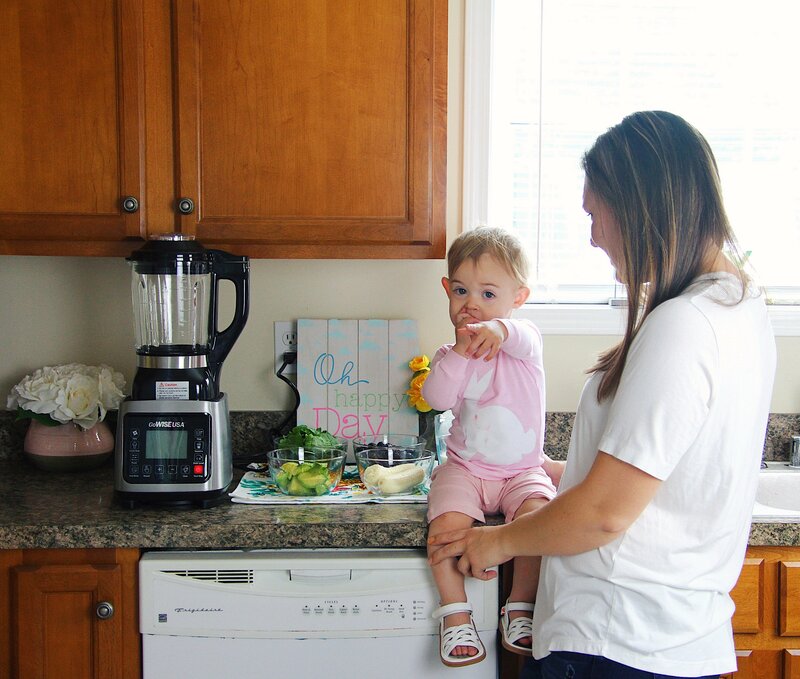 I figured if Cora loves them, I’m sure other kiddos would to & I’d love to share this smoothie recipe with you. Disclaimer though, this is my first recipe creation so if I miss a step or forget something, do ask in the comments. Like I said above, I’m no pro! Rinse & Prepare all fruits/spinach/kale. 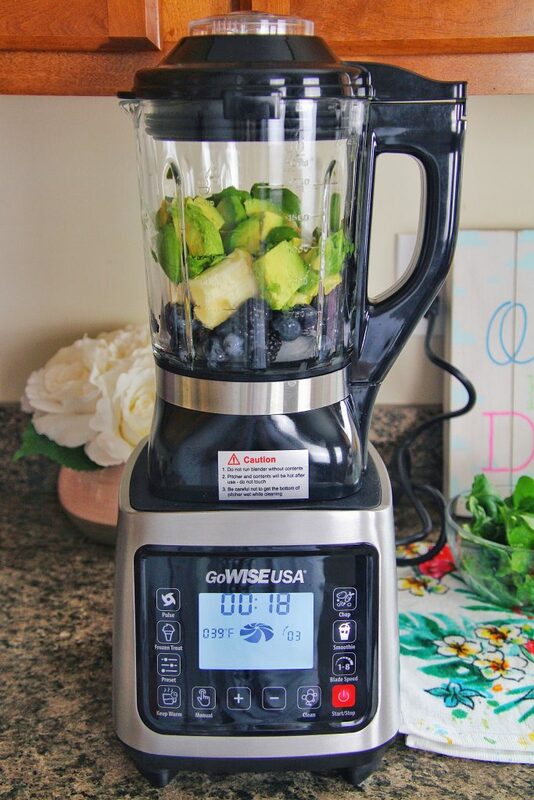 Combine berries, avocado, banana, and ice in blender. I started out with 10 pieces of ice I believe, and then added more throughout the process. The amount of ice really depends on how you like your smoothies, thicker or thinner. Blend!! 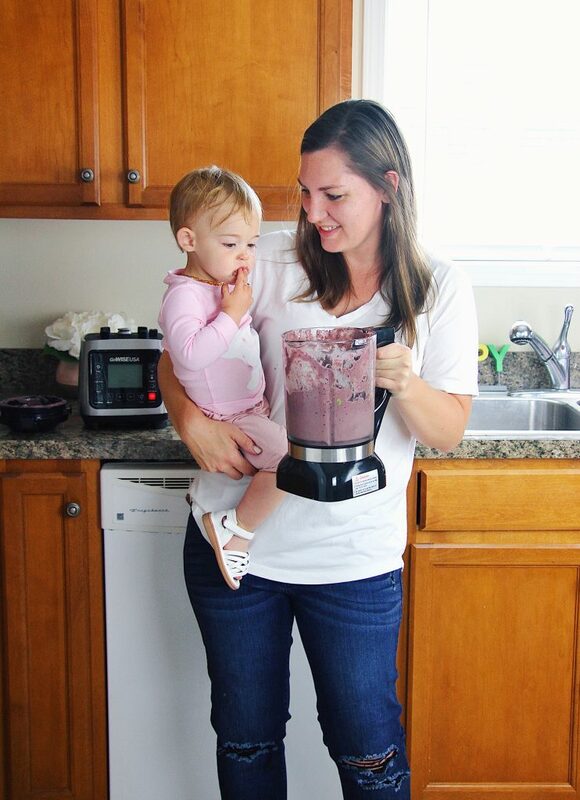 The best part of the GoWise Blender is that all you have to do is select the smoothie button. 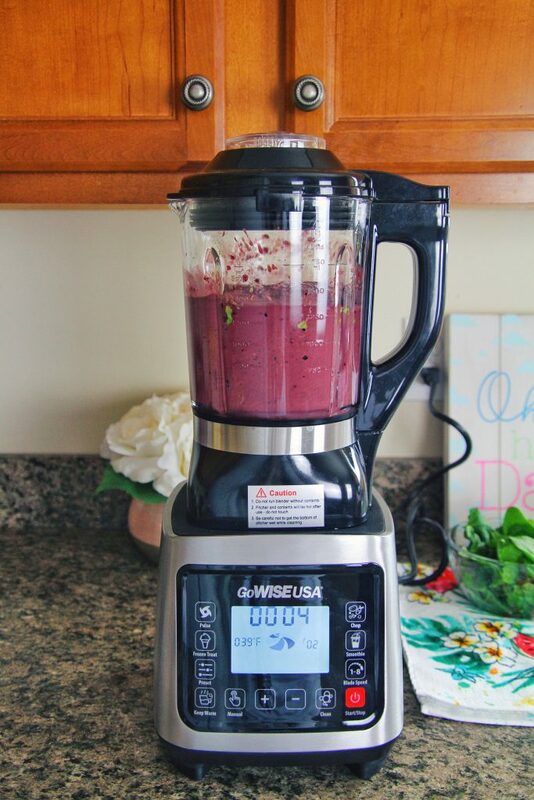 It has a set power & time to blend for a smoothie so SUPER EASY, literally just a push of a button. Next add in the spinach/kale, milk, & honey. I added just a little but of honey at a time too. Again, determine this by taste, but the honey is important because it adds a little sweetness to the smoothie. Cora enjoyed helping me too! This is before adding in milk, spinach/kale, and honey. As you can see, Cora couldn’t wait for her glass. I kept having to pull her fingers out of it lol. 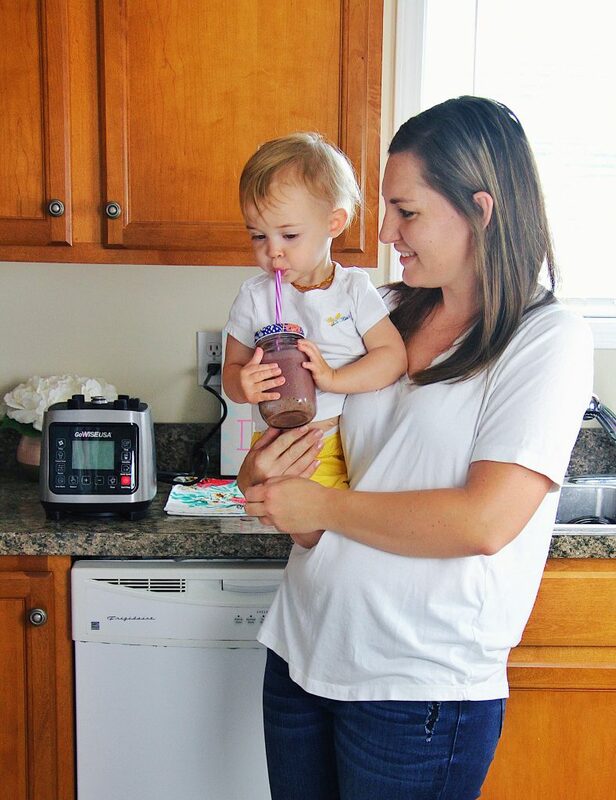 After you finish you have a delicious smoothie that is perfect for kids or adults! 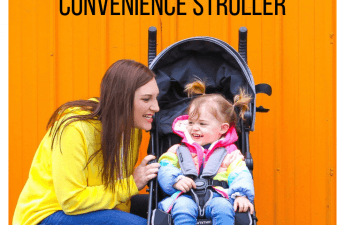 I can fill a glass for Cora to drink that moment, put some in reusable food pouches for later in the day or next morning, as well as save some in popsicle trays! 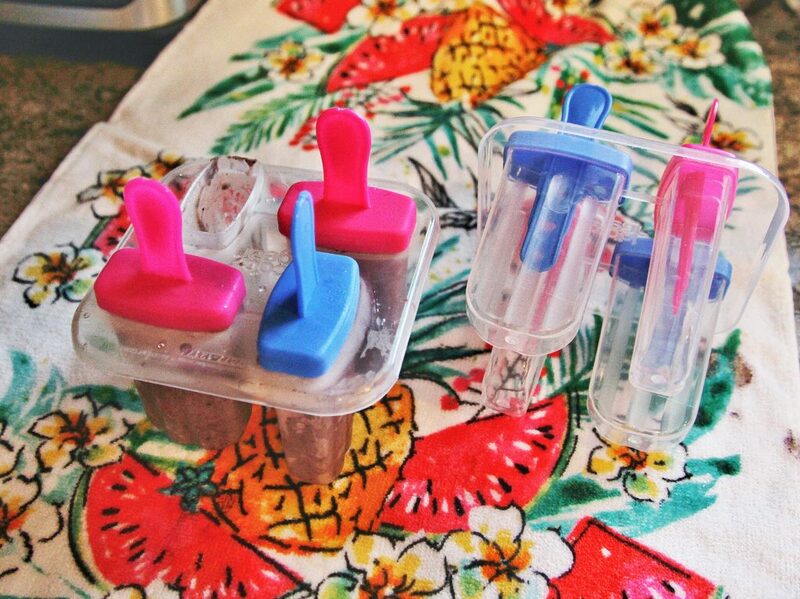 I love the idea of making hidden veggie smoothie pops, especially since we’re in 90′ heat of spring/summer right now. I bought these trays at Walmart for 89 cents! I do recommend eating these smoothie pops outside though. They are VERY messy! 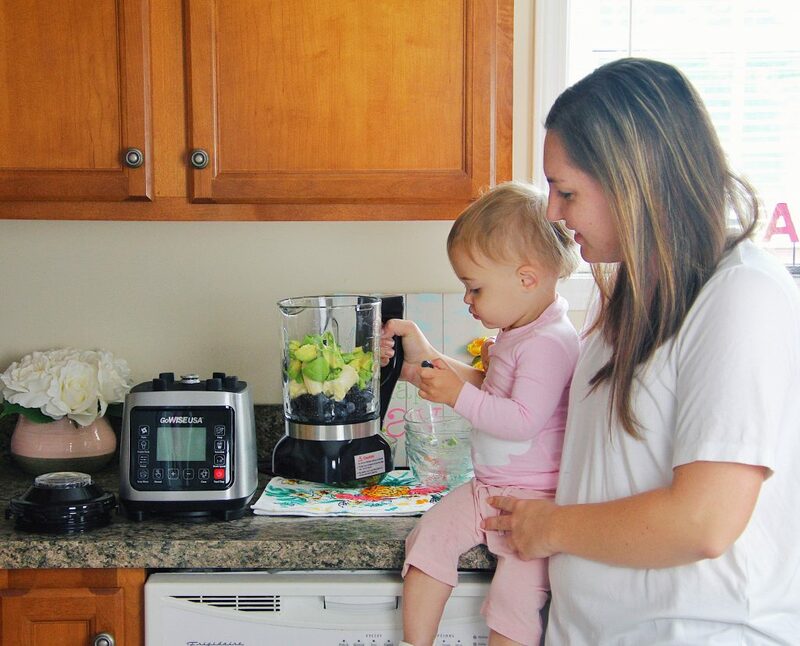 We found a fun & tasty way to make sure Cora gets the veggies she needs in her diet, or the veggies I could actually use in my diet too 😆 And it’s all super easy to do, especially with our GoWise Blender. Now I can’t wait to make a soup with this blender. If it turns out good, I’ll share it with ya’ll, but if not I’ll pretend it never happened haha! That looks sooooo good n delicious n easy! 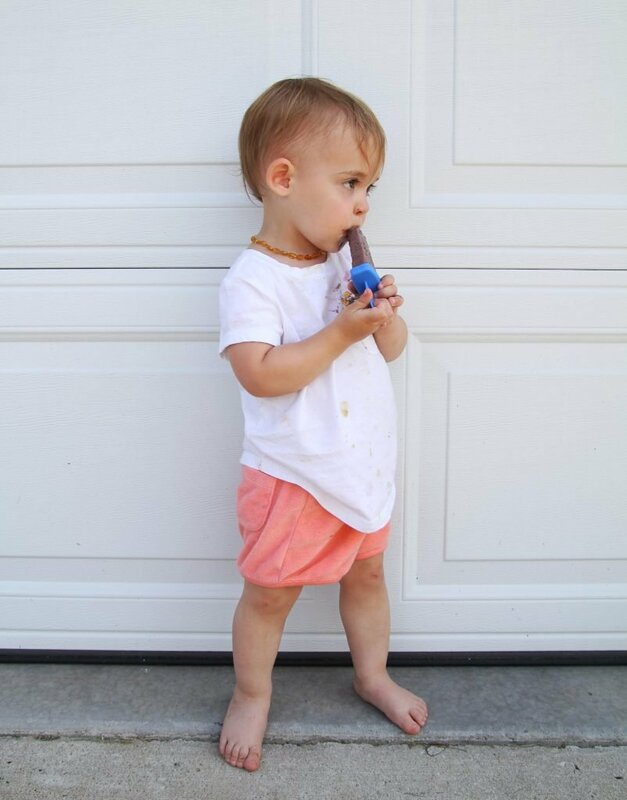 Love the popsicle idea too! Much better than store bought ones. Looks easy too. I love the idea of turning them into popsicles! I totally need to try this recipe for Grayson! Love the smoothie recipe! 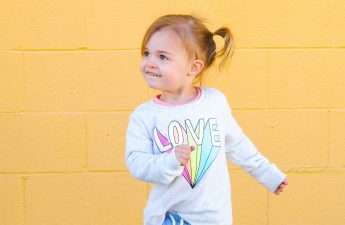 Great to make for little ones and love that you can turn it into pops! I’m gonna have to try this out! Oh yeah Smoothies are a huge hit over here too! This blender looks so good too!! Love the idea of freezing the smoothie! I’ll have to try that! a lot more attention. I’ll probably be back again to see more, thanks for the advice! Thank you for another informative blog. The place else may just I get that type of information written in such an ideal approach? Good article. I’m going through a few of these issues as well..
Just want to say your article is as astounding. The clarity on your post is just spectacular and i could assume you are knowledgeable in this subject. to keep updated with coming near near post. Thanks one million and please carry on the gratifying work. Its such as you learn my mind! You appear to grasp so much about this, such as you wrote the guide in it or something. finally got the courage to go ahead and give you a shout out from Atascocita Texas! 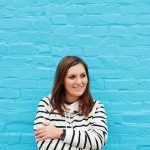 This piece of writing gives clear idea in favor of the new viewers of blogging, that genuinely how to do blogging. genuinely excellent stuff designed for readers. Remarkable! Its truly remarkable paragraph, I have got much clear idea on the topic of from this paragraph.